Don’t Allow Bed Bugs to spoil your business! What can Professional Pest Management do for you? There was a time when Bed Bugs were almost extinct here in southern california however, over the last few years, Bed Bugs have become much more prevalent. Professional Pest Managemnt will do a thorough inspection and identify all areas of infestation to create an intensive Bed Bug treatment. If the infestation is large enough you may be able to see them crawling in the open or find them along the seams on the mattress and box spring. How can I detect Bed Bugs? Detecting bed bugs can be difficult, as they are both nocturnal and small in size. However, evidence of a Bed Bug infestation may be found in bedding and on mattresses. People sometimes roll onto Bed Bugs while they sleep, resulting in bloodstains upon the sheets. Live Bed Bugs leave clusters of dark brown or black spots of dried excrement on infested surfaces. Bed Bugs also exude a subtle, sweet, musty odor. Bed Bugs have flattened wingless, brown or reddish-brown bodies. They can be found in bed sheets, box springs, walls, clothing and luggage. They prefer tight crevices and dark locations where they can remain hidden and protected. Mattresses and other furniture may also host these parasitic insects. Bed Bugs are easily transported into previously non-infested dwellings and studies have linked outbreaks to tourism. At times you may not see the bed bugs because they are nocturnal and feed at night and hide during the day. You may wake up and find bites and welts. Generally you find multiple bites in the same general area. Bedbugs have small, flat, oval-shaped bodies. They are wingless and covered in small hairs that make their bodies appear to be striped. Adults are brown in color, although their bodies redden after feeding. Full-grown bedbugs move slowly and measure between 1/8 and 3/16-inch, making them visible to humans. Nymphs are approximately the size of the head of a pin and are white or gold until they feed. Their pale coloration acts to camouflage them against mattresses and light carpets. Nymphs are approximately the size of a single lentil or apple seed. If you have detected a Bed Bug infestation within your facility or home, contact us immediately for a FREE inspection and quote. One bed bug is an infestation. If one is found, you can bet there are more where that one came from. If we find bed bugs in one room or apartment unit we recommend that the adjacent rooms and units be treated at the same time. In approximately 35% of the adjacent units inspected we have found bed bugs that had not yet been found by the owners or tenants. Due to the fact that bed bugs migrate we want to ensure that the surrounding units and bedrooms are kept under control and bed bug free. Preventing the problem from migrating to the adjacent units is easier than allowing the problem to spread, and will save you money in the long run. 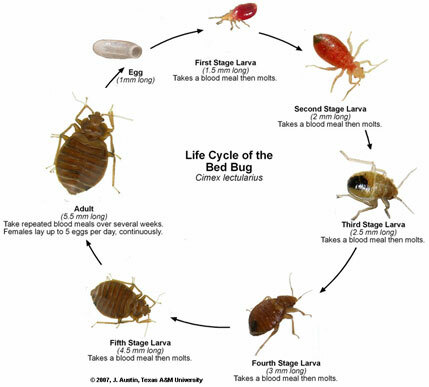 There are several chemical methods to treat bed bugs. Your account manager after inspecting will create a plan showing you the different options and methods available for your facility. Professional Pest Management can treat using heat and steam machines designed to kill immediately all active infestations of bed bugs. Bed Bugs are small, nocturnal, wingless insects that belong to the family of Cimicidae. They feed on human blood and other warm-blooded hosts. They are oval in shape and grow up to 4-5mm long when fully grown. Their skin color is rust brown to a deeper red brown. Bed Bugs are also known as “mahogany flats”, “red coats” and “chinches.” The adult bedbug does not have any wings and has a flattened body. Not only are they dorsoventrally flattened, but they are also thin which creates a great advantage for them. They can hide in unusual places such as behind baseboards, floor cracks, and under carpets or behind loose wallpaper, which makes them difficult to detect. Not only are they difficult to detect, but Bed Bugs also tend to stay close together and have a distinctively sweet, yet unpleasant smell. 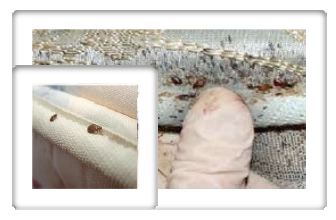 Blood spotting on mattresses and nearby furnishings are also signs of a Bed Bug infestation. Bed Bugs have existed since the ancient times and are found in temperate climates throughout the world. There are different types of Bed Bugs, but the common bedbug with a scientific name of Cimex lectularius, is adaptable to human environments. Since they can survive in birds’ nests, they can be seen in houses and buildings that have several bird nests, particularly on rooftops. They are also known to feed on bats or household pets, but their typical source of nutrition is human blood.